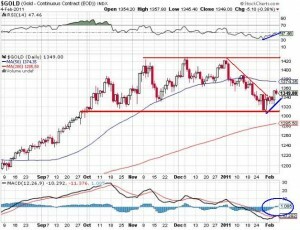 Has gold bottomed, or is their more carnage to come? 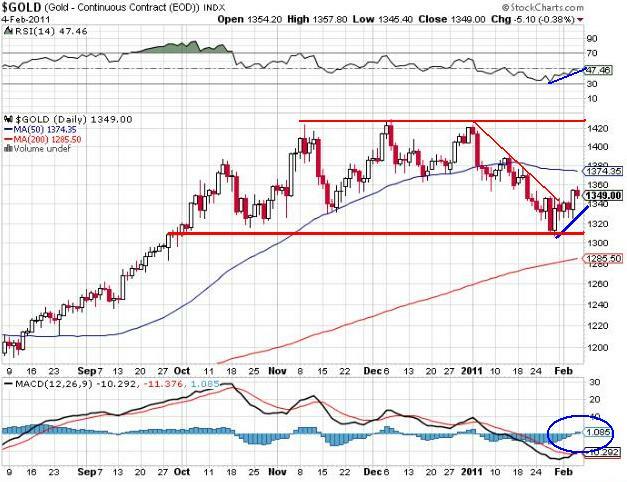 My answer, of course, is that yes, gold has bottomed. It would appear that the area just above $1,300 is a significant support level, and now that we have spent a week above that level, we should continue to increase from here. The RSI is powering up to the 50 level, which is generally an excellent buy point, and the MACD Histograms at the bottom of the chart have just turned positive, for the first time this year, so it all looks good to me. 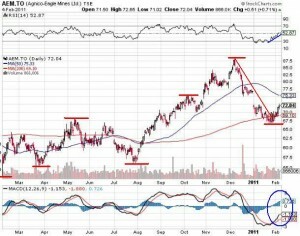 IMG formed a double top in May and October of last year, but has continued to make a series of higher highs, and this week actually made a new 52 week high. 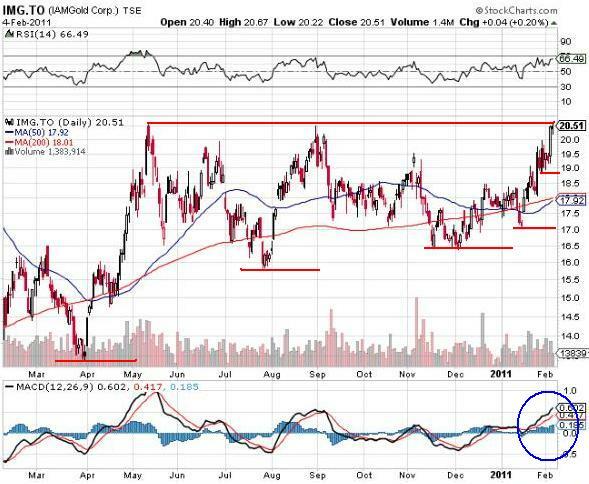 I haven’t owned IAMGold Corp. for a a few years now, and I have no plans to buy it (presumably because I’m an idiot; a stock making a new high is exactly the kind of stock you should be buying), but it is very important for the health of the overall gold sector that stocks start making new highs. Someone has to lead the sector, and it appears that IMG is taking on that role, at least for now. 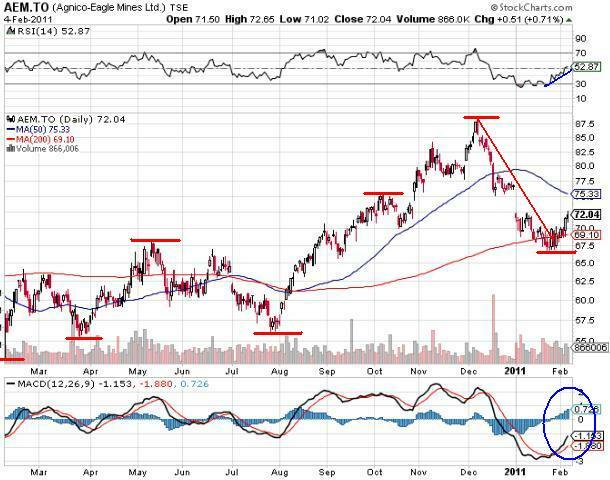 Agnicio-Eagle didn’t “double top”; it made highs in May and October, and then again during the blow off in December. 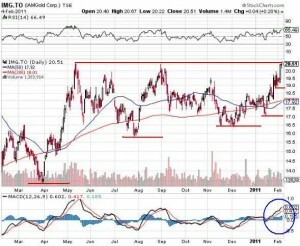 But the higher they rise the harder they fall, and AEM got killed along with the rest of them, dropping from $87.91 on December 6 all the way down to $66.91 on January 24, for a drop of almost 24%. Yikes. A recovery back over $72 is nothing to write home about, but again, a rally has to start somewhere, and I suspect this is where it begins. My assumption is that the JP Morgan and the rest of the Big Boys spent the month of January hammering the price of gold and silver so they could cover as many shorts as possible, and now they will move to either the sidelines, or the long side, and ride it back up. That’s what they do: ride it down, ride it up, lather, rinse, repeat, over and over. The weak hands get scared when it drops and sell. They then get excited when it goes up, and they buy. Since we know how volatile this market can be (and a drop of 24% on a blue chip stock in a matter of six weeks is obvious volatility), and since we are convinced that the medium and long term trend is up, the logical strategy is to hold. I’m not on margin, and I don’t have a million dollars invested in options that will expire next week, so I can wait. I’ll be patient. I am now 87% invested, with only 13% in cash, so I’m poised for a big run up over the next few months. Perhaps I should have more cash on the sidelines, but since I have no need to sell anytime soon, I’ll stay invested and take my chances. Thanks for reading; stay patient; see you next week. What will the price of gold be on December 31, 2016?